Conductive atomic force microscopy on c-plane of ~5-20 nm InN nanocrystals grown onto Si/Ta substrates by 157 nm pulsed laser deposition exhibit thermionic Schottky emission between the Pt/Ir tip and the InN nanodomains and charge memory effects identified from the hysteresis loop between forward and reverse I-V curves. The effects are due to inhomogeneous electron distribution on the surface of nanodomains and the electron confinement at the edges of the boundaries that cause local modulation of the charge neutrality and Fermi levels and put an upper limit of 4.7 eV at the electron affinity of the c-plane. (a) AFM image showing the morphology of an individual InN macrodomain on the Si/Ta substrate (S). (b) C-AFM image of (a) indicating ~5-20 nm wide conductive nanostructures. (c) Double-sweeping where hysterysis of I-V curves is inicated (point 1 of image (e)). (d) The same for point 2. (e) Close C-AFM image indicates regions with high conductivity (white coloured regions). (f) Dependence between the logarithm of Schottky current and the bias voltage of the tip for the 1 and 2 points of (e). The linear response was obtained by fitting the thermionic Schottky emission model to the experimental data. (a) C-AFM image of InN nanodomains. The individual nanocrystals, might be, (I) isolated (i.e. having no common boundaries. (II) Overlapped (i.e. with common boundaries, point A, or (III) partially isolated (i.e. with common boundaries with their neighbours only at certain points, point B. The asymmetry of the peaks corresponds to overlapped nanodomains. (b) Current distribution following a scan along the line of (a) for tip bias voltage . The distance between the points A and C is ~14 nm. (c) The linear dependence of the logarithm of the charge, induced by the tip, and the size of the nanodomains for different bias voltages of the tip. Schottky and charge memory effects in InN nanodomains. N. Spyropoulos-Antonakakis, E. Sarantopoulou, Z. Kollia, G. Drazic and S. Kobe, Appl. Phys. Lett. 99(15), 153110 (2011). Long-term oxidization and phase transition of InN nanotextures. Nanoscale Res. Lett. 6, 387 (2011). ICFSI 13, International Conference on the Formation of Semiconductor Interfaces, , Prague, Czech Republic, 3-8 July 2011. 11th Trends in Nanotechnology International Conference, TNT 2010, Braga, Portugal, 06-10 September, 2010. 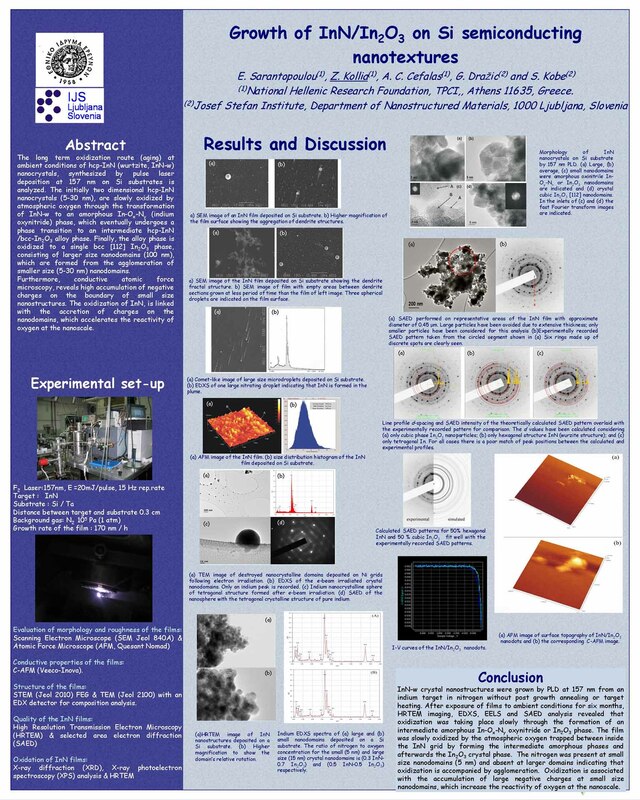 6th International Conference on Nanosciences & Nanotechnologies - NN09, Thessaloniki, Greece, July 13-15, 2009.